Fru-Gal.org: Operation Christmas Child: Time to stock up on school supplies for pennies! Operation Christmas Child: Time to stock up on school supplies for pennies! I really can't believe that it is already time for back-to-school deals, but apparently we are in the season! This is one of the best times of the year to stock up on items for your Operation Christmas Child shoe boxes, for mere pennies out of pocket! Check out the weekly fliers for office stores, such as Office Max, Staples, and Office Depot each week to see what items they have marked down. I have a local Office Max right next to one of the grocery stores I frequent, so this works out perfect for me to stop in and pick up their sale items each week. 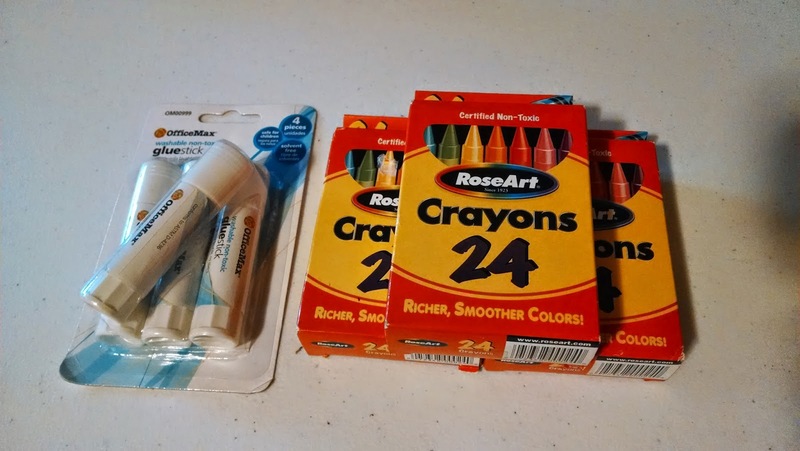 Yesterday, I was able to find 24 count crayons for a quarter each and a four pack of glue sticks for a quarter also. I paid $1.06 after tax for the above items! The glue sticks are needed for our kindergarten home school, while the crayons will make wonderful additions to some shoe boxes come Fall.